The CSS Virginia is interesting in more ways than one. Not only was she the Confederate participant in the first ever battle between ironclads at the battle of Hampton Roads, but the ironclad as such, was something new. She sure stirred up some notoriety in her brief career. First in anticipation as she was constructed from the remnants of the USS Merrimack, and later with her destructive debut on March 8, 1862 - the day before the famous encounter between the USS Monitor and "Merrimack". USS Merrimack before becoming the Confederate ironclad Virginia. 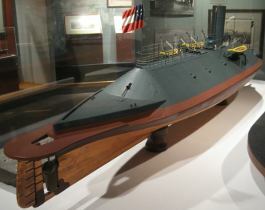 A model at the Mariners' Museum in Newport News. She had rammed the Cumberland and left her sinking, without any receiving any serious damage herself. She then went on to set the USS Congress ablaze while the USS Montana went aground in panic trying to escape. It must have felt good aboard the CSS Virginia that day. The Virginia is not an easy subject to research for building a ship model. 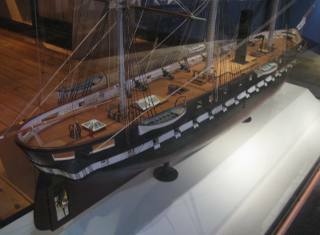 To illustrate, I have pictures of two models in two high class naval or maritime museums. The first is from the Hampton Roads Naval Museum and the other from the Mariners' Museum in Newport News, Virginia. There are no surviving photographs of the CSS Virginia – only sketches and drawings. Many contemporary documentation such as correspondence, diaries and journal entries often are contradicting. It's a jigsaw puzzle where it helps to be an expert historian, naval architect and anthropologist all in one. Assuming both models were thoroughly researched, a great number of decisions had to be made that caused them to come out so differently. It's also fair to assume both models were meant to depict the ship as she appeared at the battle with the Monitor. 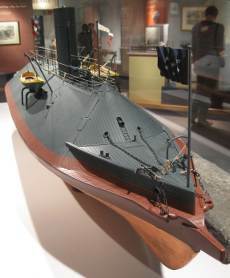 Stern view of the CSS Virginia model at the Hampton Roads Naval Museum. 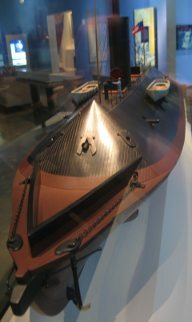 It appears the model at the Hampton Roads Naval Museum put more weight on the early plans drawn by the designer, John L. Porter. The original is in ink with numerous notations in pencil. The question is, which changes were implemented and are they all there? Until long lost photographs resurface we'll probably never know. On this model the breakwater (in this instance sometimes referred to as bulwalks) is included both in front of and behind the casemate. Both are also decked, which is in accordance with plans by Porter. The model at the Mariners' Museum has only the breakwater at the stem, not including the "wedge" at the stern. There are other features that confirms that they have had access to the plans but chosen to exclude this feature. Stern view of the Virginia model at the Mariners' Museum. It is possible that the stern breakwater was meant to be built but was never completed. As news arrived the USS Monitor was being towed into the area they may have launched her in haste without it. 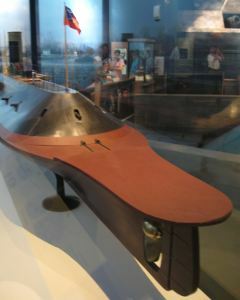 Bow view of the Virginia model at the Mariners' Museum in Newport News. It makes sense to have the breakwater area decked as in the Hampton Roads model. With minimal freeboard this area must have been taking on a lot of wash and spray - virtually impossible to bail while under power. Having it decked makes good sense from a practical standpoint. Other differences that can be seen on these models include the anchor chains, hawsers and ways to work the anchors. I'd assume there is a capstan or windlass somewhere inside the casemate. It never appears on any plans that I've seen. The length of the ram is also different. The ram on the Mariners' Museum model is shorter. This is consistent with correspondence about the structural integrity if its attachment. 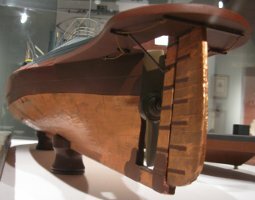 As I recall, it was originally intended to be four feet long but was shortened to two due to damage to the casting as they were in the process of attaching it to the hull. Rudder detail of the Virginia model at the Hampton Roads Naval Museum. As can be seen, the model at the Hampton Roads Naval Museum has an opening to access the propeller, just as the USS Merrimack before the conversion to an ironclad. 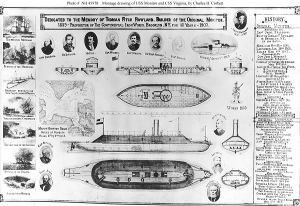 A drawing depicting the Virginia and USS Monitor. The plan was probably drawn up in the early 1900's. Picture courtesy of Naval History & Heritage Command. The plan above is the only one I'm aware of available for free online. I looked closely, and unfortunately the plan is not very accurate.